DALI device type 8 (Color control) as stipulated in IEC62386-209:2011 works well with the tunable white application. The light intensities and color temperatures of the tunable white LED modules can be programmed easily by an application in DaliSuites. 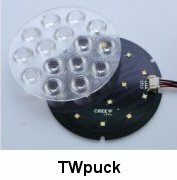 Two types of tunable white LED modules are offered, namely TWstrip linear module, and TWpuck round module. Each module is soldered with two separate LED strings. One string is of warm white color LED lamps, which is of 2700K CCT. The other string is of cool white color LED lamps, which is of 6500K CCT. By adjusting individually the light intensities of those two LED strings, desired color temperature can then be achieved.